Love, Mrs. Mommy: Step2 Hot Wheels Extreme Thrill Coaster Giveaway! Step2 Hot Wheels Extreme Thrill Coaster Giveaway! I've partnered with some of my favorite bloggers to bring you this wonderful giveaway! Best of luck everyone! Welcome to the Step2 Hot Wheels Extreme Thrill Coaster Giveaway! Do you have a little Hot Wheels fan? They’re going to love this awesome Hot Wheels Extreme Thrill Coaster from Step2! Miranda at Thrifty Nifty Mommy is sharing all about her family's experience with this coaster today. Click HERE to read all about it! Bring all of the excitement of an amusement park right to your own backyard with the Hot Wheels™ Extreme Roller Coaster by Step2! Little thrill seekers can push the coaster car up the non-slip step ramp to the platform peak all by themselves to further enhance their gross motor skills! This study, extra-long kid’s roller coaster will be an instant neighborhood hit! Made in USA of US and imported parts from China. The Hot Wheels™ coaster car, decals and styling will excite children of all ages and encourage them to get outside and play! 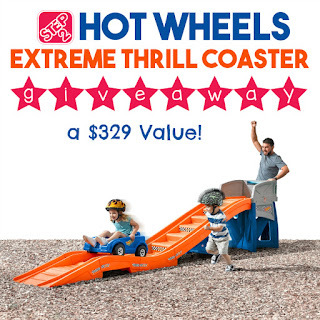 We’ve partnered with Step2 to give one lucky reader a Hot Wheels Extreme Thrill Coaster for their little race car fan, a $329 Value! Open to the continental US only. Ends 8/27/18 at 11:59 PM EST. Enter using the Giveaway Tools form below. Good Luck! Disclosures: This giveaway is not affiliated with Facebook, Pinterest, Instagram, or Twitter. Step2 is responsible for prize fulfillment. For questions about this giveaway, please contact thriftyniftymommy@yahoo.com. I would love the WHISPER RIDE TOURING WAGON for my daughters! It would be a great way for me to pick them up at the bus stop and walk to the park! LIFESTYLE™ DELUXE KITCHEN is something else I would love to own. Would Love The Thrill Ride Rollercoaster For My Great Nephew!! I would love to have the Naturally Playful Adventure Lodge play center.